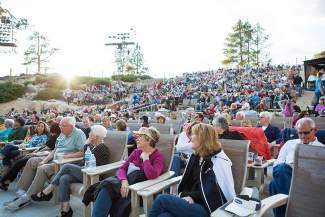 A packed crowd settles into the ampitheater at Sand Harbor for the July 12, 2015, performance at the Lake Tahoe Shakespeare Festival. 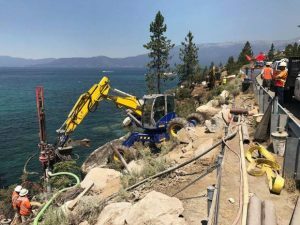 INCLINE VILLAGE, Nev. — Entertainment, food, family, and friends will converge under the stars on the scenic shore of Lake Tahoe next summer as Lake Tahoe Shakespeare Festival launches its 2016 season with two mainstage productions. LTSF Producing Artistic Director Charles Fee will direct The Comedy of Errors, and Victoria Bussert will direct Forever Plaid, through a special arrangement between LTSF and Music Theater International. The Comedy of Errors promises a double dose of laughs. When two twin brothers and their two twin servants are unexpectedly reunited after three decades apart, an unsuspecting port city is torn apart at its seams. Design-inspired by Rio de Janeiro’s colorful Carnival celebration, this unforgettable production is sure to delight. With a zany cast of unforgettable characters, myriad mistaken identities and contagious musical rhythms, Shakespeare’s great comedy delivers triumphantly on its famous title. Forever Plaid — written and originally directed and choreographed by Stuart Ross, and originally produced by Gene Wolsk — offers a heavenly musical experience. On one stormy night in the 1960s, four eager singers known as The Plaids met their untimely ends in a cherry red 1954 Mercury on the way to their first big gig. In 2016, this quartet of comic crooners gets one last chance to return from the afterlife to do the show they never got to perform. The Plaids deliver delightfully with playful patter and angelic voices in an unforgettable show that will have audiences rolling in the aisles when they’re not humming along to the great nostalgic pop hits of the 1950s. Likewise in 2016, both productions will be performed in rotating repertory, Tuesdays through Sundays at 7:30 p.m. Discounted Early Bird tickets are on sale now through Dec. 31. Also for next year, a multi-event Showcase Series will augment the festival’s 2016 mainstage productions, featuring an array of live music and entertainment from a variety of genres. The complete lineup will be announced in the spring of 2016. This article was submitted by the Lake Tahoe Shakespeare Festival. 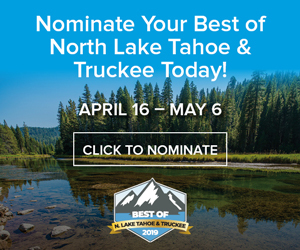 Visit laketahoeshakespeare.com to learn more.